Charter Savings Bank, one of the challenger banks to launch this year, is celebrating a landmark milestone as the bank surpasses half a billion pounds in deposits from customers. The dedicated savings bank, which launched in March of this year, has over 10,000 customers who have deposited their savings across Charter Savings Bank’s range of easy access, notice accounts and 1 – 5 year fixed rate bonds. Paul Whitlock, Director of Savings at Charter Savings Bank said: "2015 has, so far, been an incredible year for us. When we launched in March, we knew that a combination of great rates, straightforward products and reliable service would be attractive to those looking for a new home for their savings. In just over 3 months it’s encouraging to see that this formula is working. We now have more than 10,000 customers and between them they've deposited over £500,000,000 of savings across our product range, with the 1 year bond being the most popular account to date. We're delighted to be helping so many savers achieve their savings goals and look forward to welcoming many more." Welcome to our first newsletter, this issue takes a look at the savings landscape for the rest of 2015. CCFS’ workforce has already increased to nearly 300 and further recruitment is planned in the months ahead. Charter Savings Bank (CSB), the new savings proposition from Charter Court Financial Services Ltd (CCFS), celebrated its official launch with an Open Day held on Friday afternoon. The Open Day marked a celebration for the firm following what has been an already busy year in which CCFS received their banking licence in January. 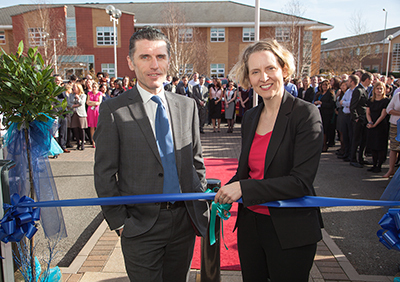 The celebrations kicked off with an opening speech from Ian Lonergan, Chief Executive Officer of CCFS followed by the inaugural cutting of the ribbon by Emma Reynolds, Shadow Housing Minister, which marked the official opening of CSB. Alongside Emma Reynolds, many other guests attended the Open Day including representatives from Wolverhampton Rugby Club and CCFS’ chosen charity for 2015 “Believe to Achieve”. The arrival of CSB is just part of a continuing regional success story for Wolverhampton, which has seen unprecedented development recently. CCFS has been based in the city since 2008 and employs 273 staff; the introduction of CSB will undoubtedly bring new opportunities for recruitment and demonstrates the firm’s commitment to the local area. Jaguar Motors has recently set up offices in the nearby area which received a £6m investment pledge from the Government in 2014. CCFS has been an avid supporter of the local community and CSB will endeavor to work with local charities throughout 2015. The firm will also continue as proud sponsors of Wolverhampton Rugby Club. Ian Lonergan, Chief Executive Officer of CCFS, commented, “The Charter Savings Bank open day on Friday was a real celebration for us all at CCFS. The past 12 months has been an exciting time for us all, with a lot of work going into the rigorous Prudential Regulation Authority authorisation process. Emma Reynolds, Shadow Housing Minister and local MP said: “In the last six months Wolverhampton has enjoyed a real boost to its economy. Many large businesses have moved offices to the surrounding area and it’s becoming a real business hub, rivaling many of the larger midlands cities. Big names such as Jaguar Land Rover have set up in Wolverhampton over the past year, and the launch of Charter Savings Bank signals further signs of economic growth. The UK’s newest bank, Charter Savings Bank has unveiled a portfolio of savings accounts designed to meet the needs of UK savers. The accounts, available from today (2nd March 2015) will focus on meeting the needs of those saving for both the short and long term, and those seeking a regular income from their savings. A full range of Fixed Rate Bonds (1,2,3,4 and 5 years) ranging from 1.80% AER*up to 2.50% AER*, allowing customers to lock away their funds whilst knowing what interest they will receive. All accounts are available with monthly or annual interest payments, giving savers the option to draw a regular income from their savings. The bank announced approval of its banking licence by the Prudential Regulation Authority (PRA) in January 2015 and represents an alternative to traditional banks, providing accounts that offer a straightforward and transparent savings solution for a customer base which is currently struggling to achieve its financial goals. The online bank, which removes the cost associated with a physical presence on the high street, is a UK bank for UK savers with a dedicated UK telephone customer support team that operates seven days a week. Charter Savings Bank is covered by the Financial Services Compensation Scheme (FSCS), the UK's deposit protection scheme, which protects customers’ eligible deposits up to a total of £85,000. Customers can also stay up to date with product information by following the bank on Twitter @Charter_SB and on Google+. Charter Savings Bank, a dedicated savings proposition from Charter Court Financial Services Ltd (CCFS), will launch in early 2015 following the approval of its banking licence by the Prudential Regulation Authority (PRA). The Bank joins a small group of challenger brands who have recently moved into the retail banking space and comes at a time when savers are suffering from a lack of options from high street banks. Acting as a true challenger, Charter Savings Bank will represent a real alternative to traditional banks, bringing a straightforward, transparent savings solution for a discerning customer base which is currently struggling to achieve its financial goals. The new Bank is covered by the Financial Services Compensation Scheme (FSCS), the UK's deposit protection scheme, which guarantees eligible customers’ deposits up to a total value of £85,000. The online and telephone based proposition, which removes the cost associated with a physical presence on the high street, is set to launch early 2015 and will be a UK bank for UK savers. The products will focus on offering attractive and competitive rates across easy access, notice and fixed rate savings accounts supported by excellent customer service. CCFS has made a number of senior board appointments to support the launch of the banking proposition and the future growth of the company. Philip Jenks becomes CCFS’ Chair after a forty year career in retail banking. Ian Ward, former Chief Executive Officer of Leeds Building Society has been named Vice-Chair and will be responsible for overseeing the savings proposition. Tim Brooke, formerly a partner of PWC who has held senior positions at several retail banks, joins the Board with specific responsibility for overseeing the Bank’s risk functions. In addition, Ian Wilson joins with a wealth of retail banking experience as the Bank’s Chief Risk Officer. Ian Lonergan, Chief Executive Officer of CCFS, will take overall control of running the new Bank. Paul Whitlock, formerly Director of Savings at Shawbrook Bank, has been appointed Director of Savings at Charter Savings Bank and is the chief spokesperson on banking issues.